During Coral Reef Week 2, a group of 35 13-15 year olds (along with a whole crew of Sanibel Sea School staff members) ventured to Big Pine Key for a week of camping and coral reef exploration. We thought it would be best if they told you about it themselves. What were the highlights of CRW2 this year? Doc Bruce: For me, the highlight was having the opportunity to allow all of our people to get in the 'deep blue' Atlantic waters offshore from Looe Key. We also decided to conduct our night snorkels in the quarry on Scout Key - it was a great night snorkel; we saw lots of great things and had very few stings. Shannon Stainken (counselor): The night snorkel was so much fun. My group and I couldn't stop giggling at all the little fish that were nibbling on us. We also spotted a moray eel, a huge sea cucumber, a flame box crab, lobsters, and a stonefish! Another highlight was the first day, when we discovered a new snorkeling spot. My group tried to do the bridge snorkel, but the current was too strong – so Doc Bruce stopped at a new spot. It ended up being phenomenal snorkeling! Sometimes unplanned adventures are the best! Emma Neill (counselor): For me, the highlights were the van trips with my day group. I had a bunch of kids who I have known for a long time (some of them since they were 4! ), but I’ve never had the chance to really spend time with them. The snorkeling was great, but I will never forget our car jam sessions or sitting together just talking about life. I think adults sometimes forget that teens have things they want to talk about, and that they really crave human connection. It was nice to feel bonded to my group over our shared experiences. Emmett Horvath (counselor/ “camp boss”): The highlight of the week for me was the night snorkel in the blue hole on Scout Key. It was one of the few times I got to take a break from running things around the campsite and get in the water, and my snorkel group saw a lot of cool creatures. Caitlin McCallion (camper): My favorite part of Coral Reef week was stepping out of my comfort zone, and trying all new things! For example, walking around barefoot in the mud and going night snorkeling. Addy Rundqwist (camper): The highlight of my week was jumping into the deep blue, where the only thing surrounding me was blue water! 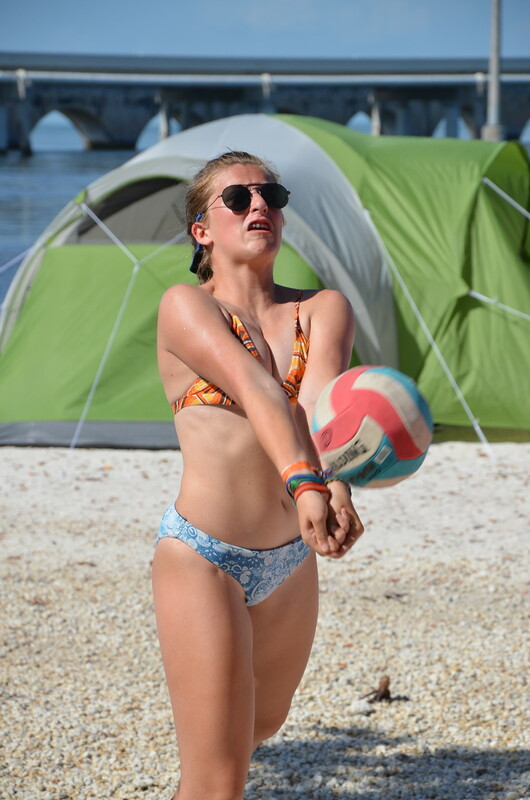 Gus Conners (camper): Some of the main highlights were the mud walk, going to the blue hole, going to Looe Key, and taking walks in the forest. And those are only a few! Is there a specific story or memory that you would like to share from the week? BN: We always try to push ourselves out of our comfort zones. This year, we had a boat motor issue and had to get towed by Sea Tow. I think that hanging out on the boat waiting to be towed is always a memorable time. It was also highly impactful to see how Hurricane Irma ravaged what we knew as LeRoy Island - now known as One Tree Island. At one point, I watched a participant look off at the setting sun, over a calm sea on the ride back to shore from the deep blue. She was full, happy, and at peace. I wish I had a camera to capture her serenity, but most importantly, I am glad she experienced that profound sense of time and place. I was honored to observe her experience from across the boat. SS: On the last day, some of the kids were getting a little restless at camp after the boat broke down. I looked at them and said "lets go on an adventure!!" and we all hopped in the van. We ended up finding a sweet jumping spot and had a blast taking off into the water. One of campers told me afterwards that it was the best part of their summer. EN: My day group was out on the boat when the engine failed. We were safe, of course, anchored relatively close to an island with plenty of water and some almonds, but we were stuck for about an hour before Sea Tow could come rescue us. My kids were troopers. Some of them hopped in the water to cool off, many of them fell asleep, and one even crawled into a storage space at the bow of the boat to get out of the sun. I will admit it was a distressing event at the time, but seeing my group handle it with great grace and ease made me a proud leader. EH: I was sitting in the central area of the campsite one afternoon, reading a book in the shade, and happened to overhear two girls, who had never met before this week, strike up a conversation and find out that they had many shared interests. By the end of the week, they were good friends and exchanged email addresses when they parted ways so they could stay in touch. It was very cool to watch a friendship grow like that. CM: A memory that I won’t forget was getting my long hair tangled in a personal fan on the first night; it had the whole tent laughing!! AR: I have been going on the Keys trip for 5 years now. Every year, I look forward to sleeping under the stars in my hammock with all of my best friends around me. GC: I will always remember seeing a huge goliath grouper underneath the boat. BN: As always, Key Deer. What could beat a Key Deer???? SS: Not one, but TWO tiny octopuses came out of the goniolithon (coralline algae) during our lab! EN: My dive group and I were exploring underneath some rocks one day, lifting them up to look for brittle stars and mantis shrimp. Underneath the very first rock we lifted, a small moray eel came darting out, to many squeals of surprise and joy through our snorkels. It was a moment of genuine happiness for us. EH: I saw two Caribbean reef octopuses during the night snorkel, and one of them was bright green! CM: The coolest wildlife sighting for me was when we got to see a massive goliath grouper under the boat. It was awesome! GC: My favorite would be a dwarf octopus that I saw on the night dive. What was your favorite way to spend free time at the campsite with your campers? BN: Just chilling around the campsite and talking. SS: Playing card games, learning new macramé-tying skills, and playing volleyball. EN: Of all our activities, I most loved walking down the beach with my group and seeing who could find the best piece of trash. I also really enjoyed hearing about their lives and their adventures. EH: I enjoyed working on knot tying skills with the kids, and just hanging out and talking about whatever was on their minds. CM: My favorite way to spend free time on the campsite was playing volleyball and football with all my new friends. AR: My favorite thing to do when I had free time was definitely hanging out with my friends and going on mud walks together! GC: My favorite way to spend my free time was taking a mud walk with everyone. BN: Apart from the bugs and the heat, I think the most challenging thing was a flat tire on our bus on the trip back home. SS: The most challenging thing for me was definitely the bugs. Baby oil is a life saver. EN: For me, the most challenging part of the week was dealing with the fact that Big Pine Key has changed a lot over my tenure there. I have been exploring that island and our lovely campground since I was 11 and for many years, I did not notice anything different. But more recently, and even before Irma, I could see that the reef was slowly dying. It is a challenge to watch things change and recognize what that means for all of us. You have to try to turn it into a learning experience, and use it as inspiration to practice better ocean stewardship. EH: The most challenging part of the week for me was ensuring that everyone got where they needed to be on time, with the proper gear, and that the campsite was well maintained. CM: I think the most challenging thing about the week was the no-see-ums, but since we were all getting bitten together it wasn’t so bad. AR: The most challenging thing about the keys is definitely the bugs! GC: The most challenging thing about the week was the amount of bugs at night. Did you experience anything new? BN: I saw basket stars for the first time in the Florida Keys - they are really cool animals and I loved seeing them. SS: I had never slept in a hammock before this trip. Also, Doc Bruce found a basket star coiled up in a sea whip. I'd never seen one in person before, so I was very excited. EN: This was my first year exploring the inland blue hole and it was also my first time approaching the quarry from land. I really enjoyed seeing both of those and being able to contrast freshwater and marine ecosystems and their importance to islands. EH: I got poisonwood for the first time...not a very enjoyable experience! CM: This was my first year going to Coral Reef Week, and I got to see the Deep Blue for the first time. It was absolutely breathtaking, I felt like I was being swallowed up by the endless blue water. AR: This year we had access to a van during the day, and we got to go on trips to different parts of Big Pine Key! We went snorkeling in a blue hole and jumped off a bridge into the water. GC: Yes, I had never seen any kind of octopus before, and while I was at Coral Reef Week I saw two. If you attended a CRW before Hurricane Irma, what differences did you notice at the campground and/or on the reef, if any? BN: A lot less trees in the campground, and the loss of the docks in the boat basin. SS: This was my first time to Big Pine Key. EN: Big Pine Key got hit almost directly by Irma and you can tell. A lot of the buildings and structures have been rebuilt in the time since, but many of them were bought by big investors who turned the run-down, homey parts of the Keys into bigger resorts. That could be good or bad, depending on how you look at it. While the structures have come back in a large way, the tree cover and vegetation is still largely dead or gone. Many of the shade trees I used to love are missing, and the Keys look much more barren than they did a year ago. A similar thing has occurred on the reefs. Many of the corals where hit very hard, creating bigger rubble zones with dead rock and fewer colonies of living coral, which is a sad occurrence. EH: There were fewer trees in the campground, and consequently a lot less shade and fewer hammocking areas. We got pretty creative with hanging up tarps! AR: Pulling up to camp was really strange because of how different it looked. There were barely any trees, and the boat couldn’t park in its normal spot because of how low the water was! The reef, sadly, isn't as healthy as it was when I first started as a CRW camper. Irma did more damage to it, but I think over the months it has gotten better. GC: The biggest difference I saw was at the campground. Next to the campground there is a big forest with trails and animals, but this year most of the trees where down and some of the trails where missing. Advice for future CRW staff/ campers? BN: Bring less stuff. Work to keep the campsite less cluttered. SS: One of our campers brought a football and a volleyball. We played during free time and it was a blast. EN: Sleep before, after, and during the trip as much as humanly possible. We all need sleep to be kind humans and the trip is exhausting with all the diving and activities. I know I'm a monster when I don't sleep enough, so try to sleep instead of staying up. And, more importantly, cut everyone some slack. We're all hot, we're all getting eaten by bugs, and we're all tired. Give people some space if they need it and act as compassionately as possible, especially to your leaders because they control if you get to go to the campground store for treats! EH: Be prepared to be uncomfortable, and embrace it. Also, bring baby oil for the no-see-ums. Pack as lightly as possible and keep your belongings organized in one location so that the campsite is cleaner and less cluttered. CM: My advice to future CRW campers would be to pack light and prepare yourself for a once in a lifetime trip! AR: Don’t be afraid to leave your comfort zone. Sleeping in tents, snorkeling in 500 feet of blue water, snorkeling at night, and jumping off a bridge into the sea are all things a typical person would not be comfortable doing. But trust me, it’s all worth it! GC: My advice for people who are just coming to the camp is that you need to put on a lot of sunscreen or else you will get badly burned. BN: We are constantly trying to improve what we do. Having a van, and adding van-based trips around the island was a great addition. We also went back to having day groups and tent groups (instead of just day groups). I think we all agreed that this model is better than just having tent groups – you get to spend time with more of your fellow campers that way. SS: I loved watching my group’s snorkel skills improve throughout the week! EN: Thank you to Sea School for giving me another summer full of salty adventures and ocean lovin'. I will never forget the moments that I am a part of the Ocean Tribe. EH: I stayed over the weekend to watch the campsite between the two weeks of camp, and took a kayak down with me. I had a great time exploring the waters around Big Pine Key by kayak, and riding the current under the bridge as I dodged pilings! CM: Thank you Sanibel Sea School for an amazing week, I appreciate all you do!